Many advocates claim that LRT has higher passenger capacity than lower-cost alternatives like BRT. A closer review of available research shows this to be an often repeated misconception that is unsubstantiated by recent real-world experiences. 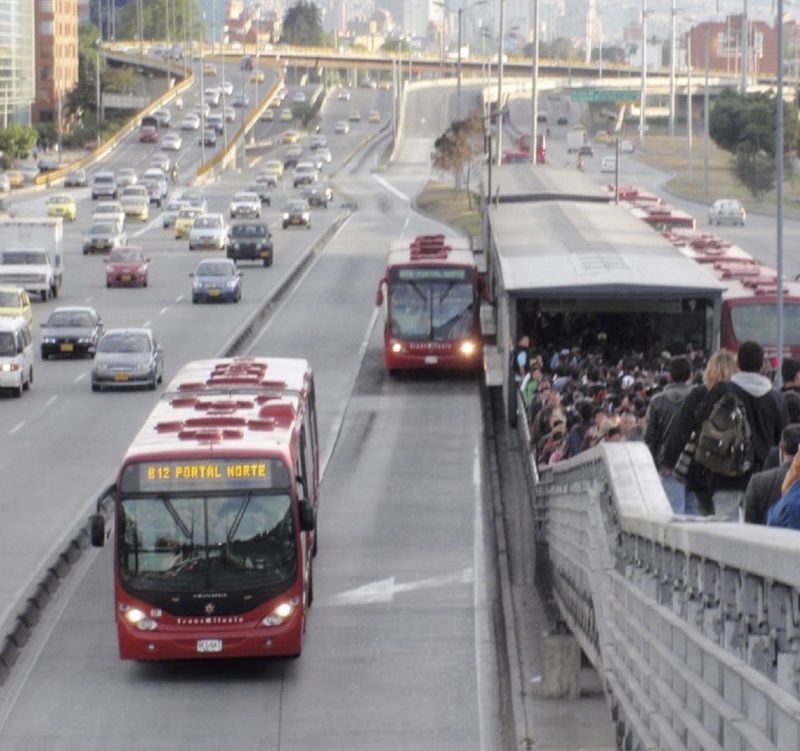 Using transit best-practices (like interlining and passing lanes at BRT stations) can substantially increase BRT infrastructure capacity as measured by people per peak hour per direction (PPHPD). In addition, using new technology like automated vehicles and double-articulated hybrid buses (eg Vossloh Kiepe and Hess) with 250 passenger capacity can further expand BRT capacity and efficiency. In the US, current transit capacities are significantly lower than those of the BRT and LRT systems mentioned above. This is because domestic capacity is measured as a function of the number of vehicles currently serving the corridor (at peak hour, in peak direction), and the physical capacity of those vehicles. 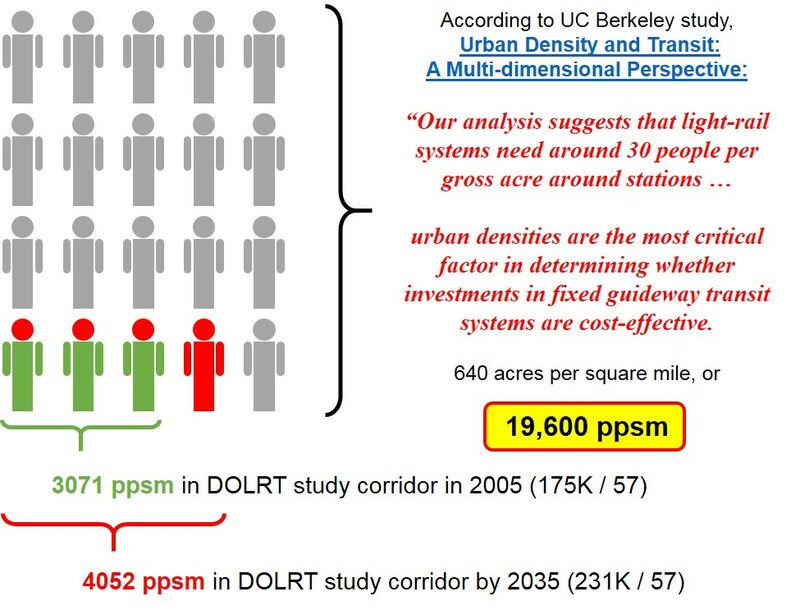 Yet no corridor in the US has sufficient demand to justify vehicular frequencies high enough to saturate the corridor. For example, the current capacity of Los Angeles’ Orange Line BRT is 1,965 PPHPD based on the existing fleet. However, the system’s theoretical capacity is much higher: were demand to grow and more vehicles put into service, capacity would increase. The LRT corridors in Los Angeles—the Gold Line and the Blue Line—have similar capacities based on the existing fleet: 2,090 PPHPD. This capacity, too, could grow with an increase in demand. Note, however, that in order to provide capacities that more or less meet current demand, Los Angeles provides less frequent services on its LRT lines due to the size of the LRT vehicles. This entry was posted in myth and tagged BRT, Capacity, LRT, Myth on January 4, 2016 by admin. While there has been much attention on light rail, the fact is that there are better alternatives that provide our communities with a better and more flexible infrastructure that can evolve to take advantage of new technology advances like autonomous vehicles, electric batteries, new business models and power distribution. By using asphalt roads, we can have a more flexible addition to our transit infrastructure that can be used by BRT, interlined with existing buses in congested areas, promote car pooling by using HOV (High Occupancy Vehicle) and eventually leverage that infrastructure with emerging autonomous vehicles … instead of building a ‘steel road’ with rails. Bus Rapid Transit (BRT) continues to expand globally, with over 400 BRT lines in 195 cities serving approximately 32.4 million people daily. 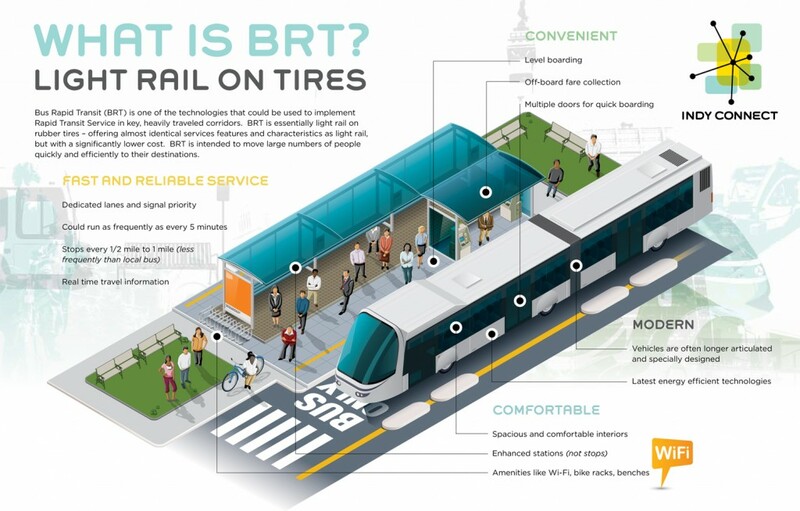 BRT is a high-quality, high-capacity rapid transit system that improves upon traditional rail transit systems at a significantly lower cost (eg Chapel Hill Transit implementation along NS corridor is estimated to cost less than $15 million per mile). Vehicles travel in dedicated lanes with traffic signal priority thereby avoiding competing traffic. Passengers walk to comfortable stations, pay their fares in the station, and board through multiple doors just like a train. So this allows us to take advantage of all of the best attributes of LRT while providing additional flexibility of sharing with other wheel-based (not rail-based) systems and the ability to reconfigured routes to adjust to our changing population and commuting patterns. For example, allowing other buses (potentially autonomous in the future) to ‘interline’ within the dedicated guideway, and ‘platooning‘ automated vehicles within the same guideway. A sort of flexible smart vehicle HOV lane which can evolve as technology changes and adapt to changing traffic patterns. Interlining refers to the ability of local bus routes, including feeder bus services to utilize the BRT running way for a portion of their trip. It is an accepted practice for BRT systems and allows more transit users to benefit from the guideway investment. Coming soon to Chapel Hill and Wake County! BRT is coming to the Chapel Hill as part of the North-South Corridor that will connect Southern Village with UNC and continue north along MLK. The study area runs from the Eubanks Road Park & Ride lot (a northern terminus) and the popular Southern Village (the southern terminus) and points in between. The NS BRT with a projected cost of $125 MILLION (8.2 miles @ $15 MILLION per mile) to start service in 2020 with annual operating cost of $3.4 MILLION. 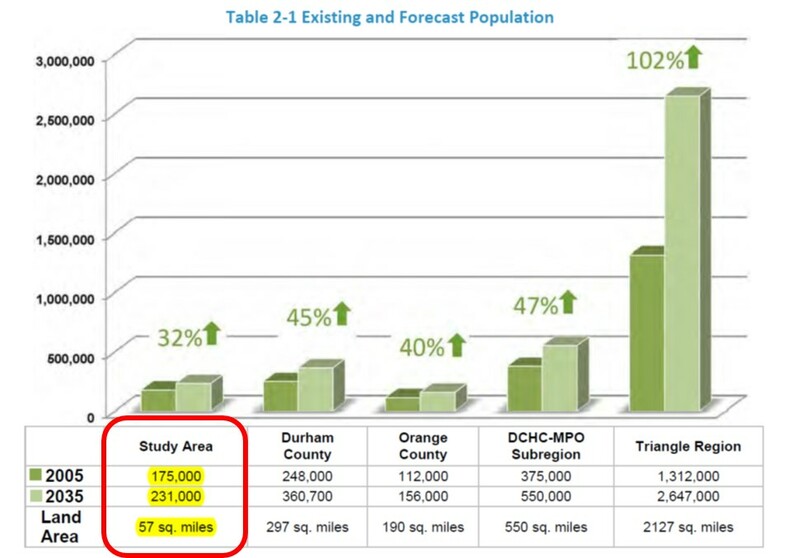 So with BRT, Chapel Hill will get mass public transit sooner (a decade earlier than DOLRT) at fraction of the cost (11% of the cost per mile to build and 12% of the operating cost) with lower local funding requirement due to higher federal grants! In fact, passengers could ride BRT for ‘fare-free’ and it would still be cheaper (for riders and taxpayers) than DOLRT to operate. For the same amount of money, we could build 166 miles of BRT (vs 17 miles of DOLRT). Now that would be mass public transit!. In addition to Chapel Hill, Wake County is planning to implement cost-effective BRT for 20 miles at $347 million ($17M per mile). Financially, Bus Rapid Transit is a better ‘price performer’ and maximizes our return on tax dollar investment over Light Rail. As a matter of fact, for the estimated $400 million in local taxes set aside for DOLRT, we could fund the NSCBRT and an equivalent Durham Orange BRT and still have funds left over! 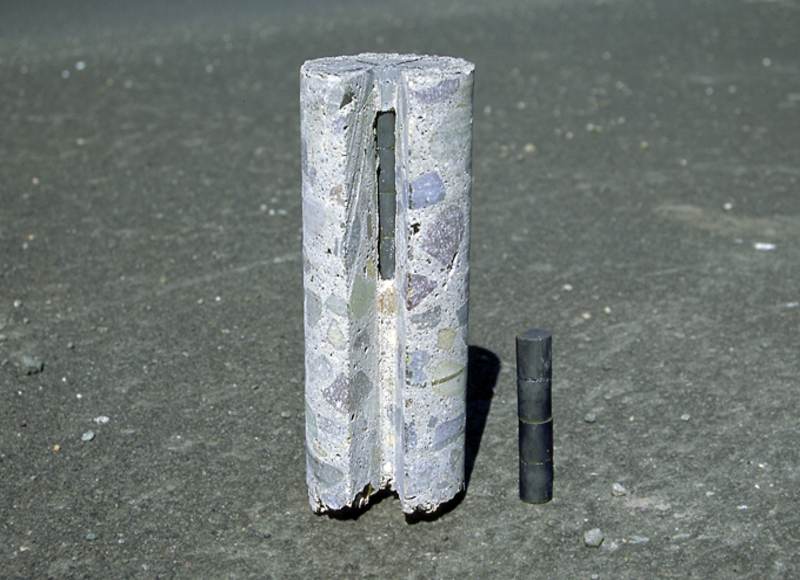 All from changing the technology to use rubber wheels rather than steel wheels. 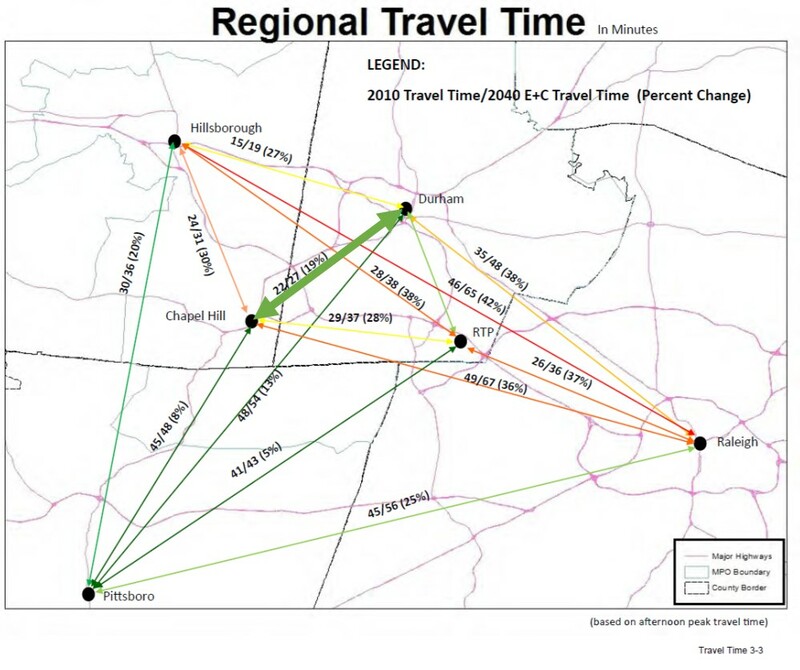 A study by the Institute of Transportation and Development Planning that analyzed 21 transit projects in 13 cities across the United States and Canada. 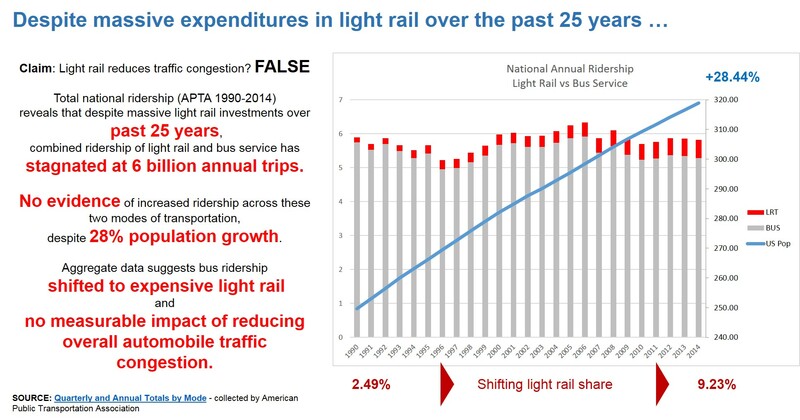 Based on their in depth research and analysis, they concluded that there is no case in the United States where Light Rail should be favored over Bus Rapid Transit. Any perceived advantages of LRT over BRT are primarily aesthetic and political rather than technical. Long term potential of BRT versus LRT? One of the major advantages of BRT over proposed DOLRT is that it is much more flexible and can be integrated into our overall transportation infrastructure. 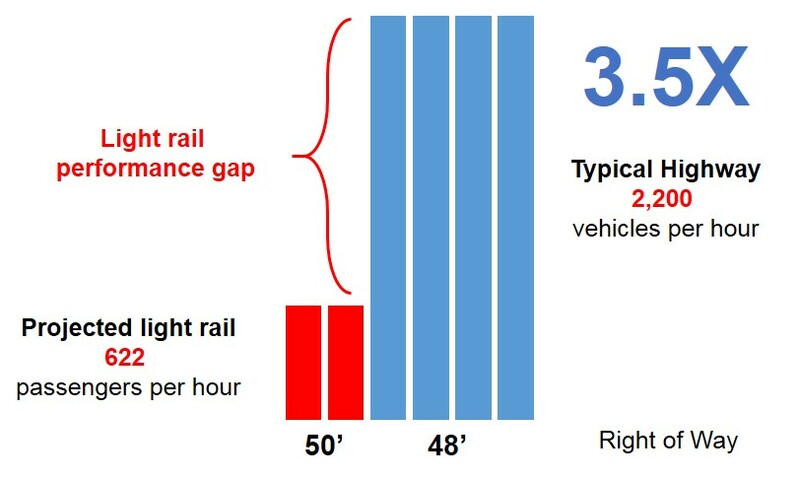 Think about all of the rail lines and how much space they consume (50′ right of way for LRT vs 12′ for a highway lane or roughly equivalent to 4 lanes), and the majority of the time they are not being used. Sitting there, waiting for the next train to arrive. And only trains can use it, and cannot be shared with other vehicles. LRT also requires additional constraints (and expense) with limits on how steep the steel roads can be and require (exclusive) “overhead” electrification infrastructure to distribute the electricity (and losing 7% in distribution along the guideways) along the 17 miles. BRT on the other hand uses roadways that can be shared now! For example, with a dedicated BRT lane, other buses can ‘hop on and off’ in short segments to bypass areas with traffic congestion. As new technologies continue to evolve, BRT and it’s infrastructure can potentially take advantage of these disruptive innovations. For example, advances in wireless / induction charging, solar roads, batteries, photovoltaics, thermoelectrics, autonomous vehicles, and many other breakthroughs. Investments in BRT infrastructure would provide flexibility and ‘future-proof’ our transit investments. 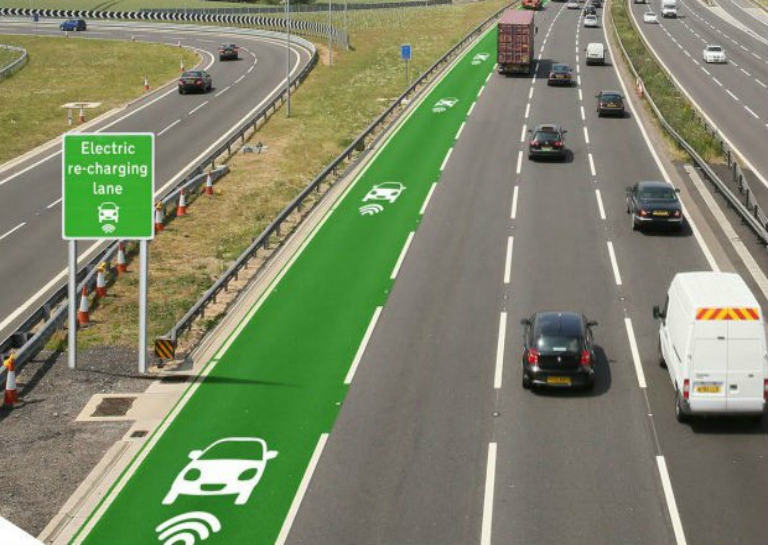 Wireless (induction) charging is already powering buses in Texas, Utah, Berlin, Mannheim (Germany) and London. 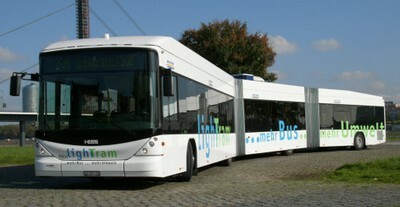 eBuses in Torino, Italy have used induction charging since 2003, Utrecht (Netherlands) since 2010, Gumi (South Korea) since 2013. And France is installing 1000 km of solar roads over the next 5 years. 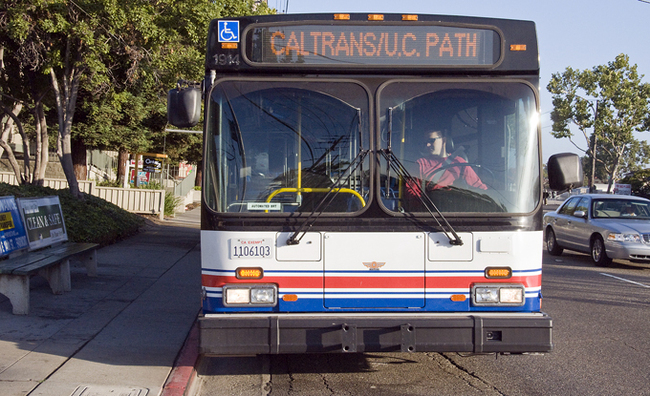 The self-steering bus developed by California Partners for Advanced Transit and Highways follows magnetic strips embedded in the road, although drivers still handle acceleration and braking and can take full control of the bus at any time. The technology could make life better for passengers by increasing efficiency, and could cut the cost of rapid transit systems. 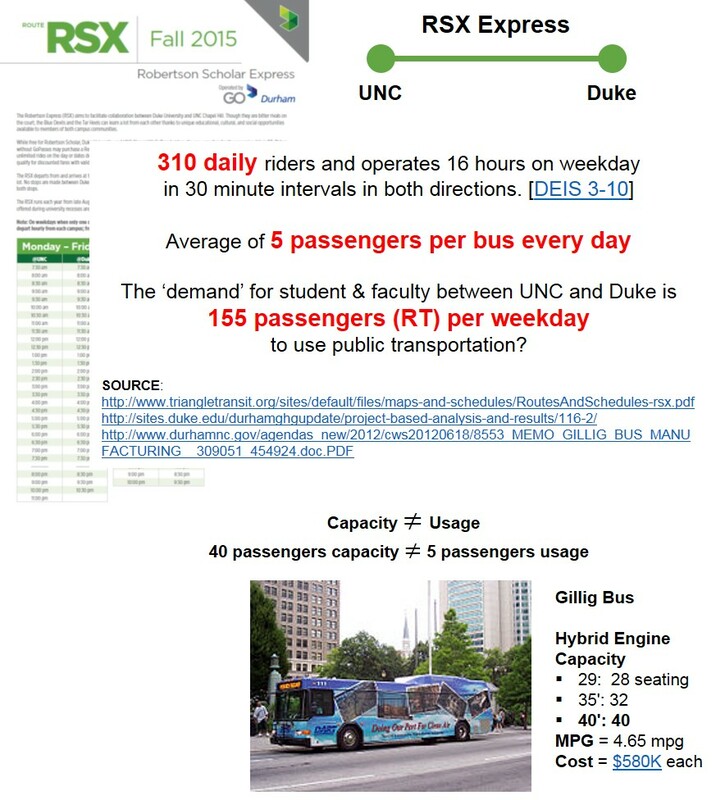 This entry was posted in Solution and tagged Autonomous Vehicles, BRT, Bus, Capacity, Chapel Hill, Durham, Efficient, Flexibility, Infrastructure, LRT on August 28, 2015 by admin. but the myth — persistent, persuasive, and unrealistic. Too often we hold fast to the cliches of our forebears. We subject all facts to a prefabricated set of interpretations. We enjoy the comfort of opinion without the discomfort of thought. There are many myths about light rail train projects that are often repeated by light rail advocates that makes it very difficult to have a fact based discussion. This light rail bias has been well documented in grand jury findings and policy studies, yet they continue to persist. Without a fact-based discussion, we will squander large amounts of tax dollars for an inflexible and obsolete light rail system that will not align with high growth areas and new emergent transportation technologies. Here is a partial list of some of these recurring myths. Light Rail reduces traffic congestion? Light Rail is faster than alternatives? Light Rail is more efficient than cars? Light Rail is environmentally sound? This entry was posted in myth and tagged Bias, Capacity, Congestion, Density, DOLRT, Grand Jury, Light Rail, LRT, OCTA on August 28, 2015 by admin.